We don’t live in Melbourne, is this a problem? Not in the least! With Skype, FaceTime, email and other technologies we can still chat face to face and plan your ceremony long before we meet in person. To complete your Notice of Intended Marriage, I need to sight either a valid passport or an original birth certificate for each of you. If you have been married before, I also need to sight original documentation proving how your last marriage ended (divorce or death certificate). If any of your documents are not in English, you will need to have them translated by a certified translator. How many weddings do you book each day? I like to really get to know the couples I work with and it's for that reason that I accept only a limited amount of bookings each year. Generally speaking, I book only one wedding per day, however occasionally exceptions will occur when weddings are at opposite ends of the day or at the same venue. This means that if anything goes wrong (wardrobe malfunction, broken-down cars, road closures…) you’re not also worrying that your celebrant has to leave before you get there. You are my number one priority for the day. The earlier, the better! While I don't currently book weddings more than a year in advance, dates in peak season (September-May) tend to book out between 10 - 12 months prior. As I only book a limited amount of weddings per year, please contact me as soon as you have set a date to avoid disappointment. Where will you travel to for ceremonies? I am based in inner Melbourne, however I am very happy to travel. I have conducted weddings in several Australian states, remote locations and have even flown to Germany to celebrate a wedding. I am also able to conduct weddings in many states of the USA. Put it this way - if it's on this planet, there is no such thing as too far. I provide a boutique service creating personalised, engaging ceremonies and my fee is reflective of the skill, service and experience I bring to the role. If you’d like to find out more, please get in touch. Do we need to hire a PA for the ceremony? No. On the day, I provide a professional portable PA system with microphone to ensure that all your guests can hear your ceremony clearly, as well as Bluetooth and cable connectivity to play music through. Ja, Deutsch! I speak German and would be very happy to conduct part or all of your ceremony in German to honour your heritage and include your guests. I also know a smattering of Indonesian and Swedish. I am happy to learn phrases in other languages if you like. We got married overseas. Can you marry us again here? If you were legally married overseas, then under Australian law you cannot be married again. 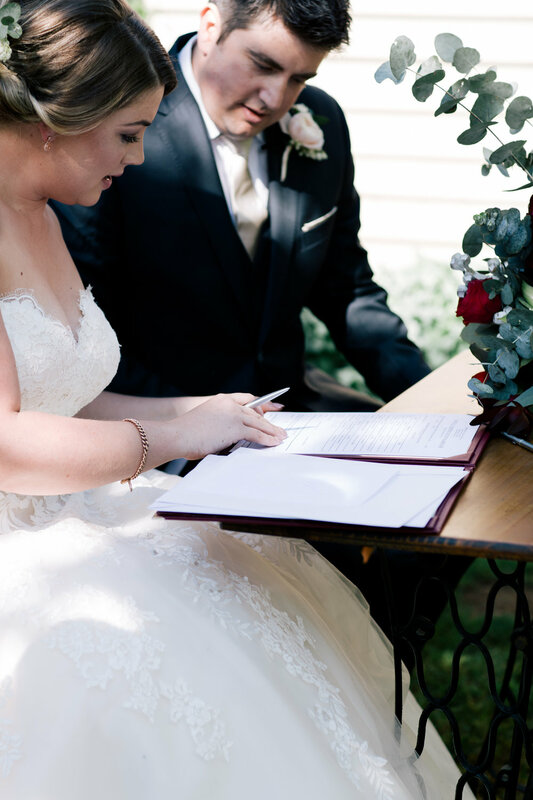 If the ceremony you had overseas was not legally binding, then I can assist you to get married here in any way you like, whether that be a brief, legals-only ceremony or something more personal.